Well, I had the knitting part of the scarf finished by the17th, but it took me a few days to complete the project by finishing it off with the picot crochet edge. Also this week, while I recover from my silly hand injury, I'll be finishing off some more designs for some new laser cut jewellery!! Hopefully I'll be able to stop being a little bit obsessive about the designs being "perfect" and actually have them made and in the store within the month :-) That would be nice!! Your looks scarf amazing great job!!! 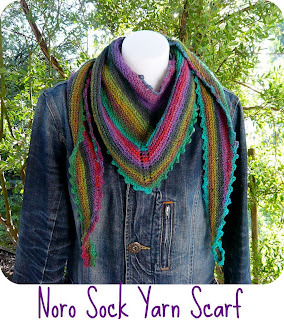 Hello Shara, i wonder witch number of Noro Sock Yarn you used to this lovely shawl?